Dry pigments are especially hazardous because they are easily inhaled and ingested. They are used in encaustic, paper-marbleizing and in the fabrication of paint products, and will be discussed more thoroughly in the section below on pastels. 1. Poisoning can occur if toxic pigments are inhaled or ingested. 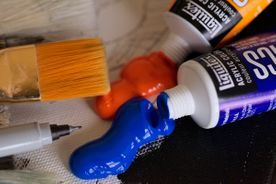 The main hazard in standard painting techniques is accidental ingestion of pigments due to eating, drinking or smoking while working, inadvertent hand to mouth contact, or pointing the paint brush with the lips. If methods such as spraying, heating, or sanding are employed then there is an opportunity for inhalation of toxic pigments. 3. Some of the inorganic pigments, in particular cadmium pigments, chrome yellow and zinc yellow may cause lung cancer. In addition lamp black and carbon black may contain impurities that can cause skin cancer. 4. Chromate pigments (chrome yellow and zinc yellow) may cause skin ulceration and allergic skin reactions (such as rashes). Children under the age of 12 should not use or be around artists' paints or professional drawing media. They should only use art materials that are approved for use with children. See our data sheet "Children's Art Supplies Can be Toxic" for more information on children. Pigments Painters use pigments in oil paints, acrylics, watercolor paints, gouache, encaustic, poster paints, casein paints and tempera. Sometimes commercial paints such as oil enamel, epoxy paints and automobile paints are used. Paints are pigments mixed with a vehicle or binder. Both inorganic and organic pigments are used as colorants. 2. The classic example of a toxic inorganic pigment in painting is white lead, or flake white (basic lead carbonate). Lead pigments can cause anemia, gastrointestinal problems, peripheral nerve damage (and brain damage in children), kidney damage and reproductive system damage. 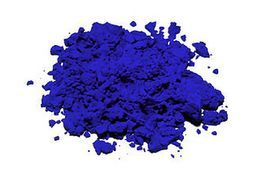 Other inorganic pigments may be hazardous, including pigments based on cobalt, cadmium, and manganese. 5. The long-term hazards of the modern synthetic organic pigments have not been well studied. 1. Obtain MSDSs on your paints to find out what pigments you are using. This is especially important because the name that appears on the tube of color may or may not truly represent the pigments present. Manufacturers may keep the name of a color while reformulating the ingredients. 2. Use the least toxic pigments possible. Do not use lead or carcinogenic pigments. 3. Avoid mixing dry pigments whenever possible. 4. If dry pigments are mixed, do it inside a glove box (a box with a glass or plexiglas top and holes in the sides for arms) or inside a laboratory-type fume hood. 5. Wet mop and wipe all surfaces when using dry pigments. 6. If a glove box or exhaust hood is not practical, wear a NIOSH-approved toxic dust respirator when mixing dry pigments. A toxic dust and mists respirator would also be necessary if you sand the finished painting; if you use a torch, a toxic dusts, mists and fumes respirator would be needed because of the possibility of generating metal fumes from the pigments with the torch. 7. Avoid using dishes, containers or utensils from the kitchen to mix and store paints and pigments. paints and automobile paints are used. thoroughly in the section below on pastels. 1. Poisoning can occur if toxic pigments are inhaled or ingested. impurities that can cause skin cancer. skin ulceration and allergic skin reactions (such as rashes). truly represent the pigments present. with a glass or plexiglas top and holes in the front. This article was originally printed for Art Hazard News, © copyright Center for Safety in the Arts. It appears on nontoxicprint courtesy of the Health in the Arts Program, University of Illinois at Chicago, who have curated a collection of these articles from their archive which are still relevant to artists today.